FREE report reveals the names of 7 big-name stocks insiders are dumping. If you own any of these 7 stocks, sell them immediately! 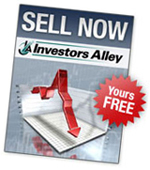 Get the full list of dangerous stocks to sell now - yours FREE until midnight tonight. We respect your privacy. Please review our privacy statement. © 2016 Investors Alley Corp. All rights reserved. | More information.